Geithner's plan will make Wall Street richer! Dean Baker, one of the first economists to argue that the housing bubble was unsustainable, writes that the experts who missed the housing bubble (EMHB) "... already wrecked the economy once." And he asks: "how many more times will they get the opportunity?" The article is worth reading and is linked here. Robert Kraig and Amy Stear have an excellent column on the abysmal failure of Milwaukee's economic and political elites to make family supporting job creation a priority. Since the late 1970's the Greater Milwaukee Committee (GMC) and the Milwaukee Metropolitan Association of Commerce (MMAC) have controlled the region's economic development strategies promoting an approach that relies on business tax breaks and subsidies. The result-Milwaukee has lost thousands of family supporting unionized jobs. It now has the 7 th highest poverty rate in the country and the second highest black white unemployment ratio. The visceral opposition to the sick days referendum is also about something larger. Like the reform battles 100 years ago, the sick days referendum advances an economic populism that the local political establishment and its allies in the business community would prefer to sweep under the rug. As the city has hemorrhaged family-supporting jobs, the political and business elite have steadfastly refused to allow job quality to become a central public policy focus. The paid sick days ordinance is a dramatic step in the opposite direction endorsed by over 159,000 Milwaukee voters. Forcing a major issue into the public sphere over the objections of entrenched interests accustomed to having their way at City Hall is exactly what La Follette era Wisconsin progressives hoped direct legislation would achieve. The city's disgraceful decision not to legally defend an overwhelming vote by its own citizens is a black mark on the progressive history of Milwaukee. But it is not too late for the city to reverse course and defend the ordinance in the next stages of the legal process. We believe it is incumbent on Mayor Tom Barrett and the Common Council to stand up for Wisconsin's democratic traditions and use the power of their offices to defend the people's right to decide. Senator John McCain has been pounding tables and railing against earmarks as if they were responsible for the nation's economic malaise. When the U.S. Bureau of Labor Statistics issues its February unemployment report on Friday expect more bad news. My back of the envelope analysis projects that employers eliminated almost 700,000 jobs in February which will cause the unemployment rate to rise to 8%, the highest rate since the recession of 1981. 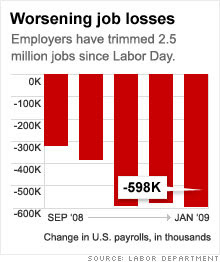 In January 2009 employers slashed 598,000 jobs. It was the worst monthly job loss since December 1974, and brought job losses to 1.8 million in just the last three months, or half of the 3.6 million jobs that have been lost since the beginning of 2008. The job loss since November is the biggest 3-month drop since immediately after the end of World War II, when defense contractors were shutting down for conversion to civilian production. January's job loss caused the unemployment rate to rise to 7.6%, its highest level since September, 1992. As bad as the unemployment rate is, it only tells part of the story for people struggling to find jobs. The January report also showed that 2.6 million people had been out of work for more than six months, the most long-term unemployed since 1983. And that number only counts those still looking for work. The so-called underemployment rate, which includes those who have stopped looking for work (discouraged workers) and people working only part-time that want full-time positions, climbed to 13.9% from 13.5% in December. That is the highest rate for this measure since the Labor Department first started tracking it in 1994. Despite these gloomy number Wisconsin Congressman Paul Ryan (R) continues to oppose efforts to jump start the economy. Ryan voted in lock step with his Party in opposing the stimulus package that provides help to the unemployed and their families by increasing unemployment benefits and food stamps and expanding eligibility, increasing Pell Grants, and investing in job creating infrastructure projects and education. Ryan's fiscal conservatism, incidentally, is new. When his Party was in power he voted for the 2001 and 2003 high income tax cuts which caused more than 50% of the Bush era record deficits. Instead of voting for legislation that helps unemployed workers and their families, Ryan has waging war against an imaginary boogie man, stagflation that even he admits does not currently exist. Nouriel Roubini, the NYU economics professor know as Dr. Gloom because he correctly predicted the current recession more than a year before it began, argues, contrary to Ryan' imaginary stagflation, that without even more aggressive federal action "this ugly U-shaped recession may turn into a more virulent L-shaped near-depression or stag-deflation (a deadly combination of economic stagnation and price deflation like the one Japan experienced in the 1990s after its real estate and equity bubbles burst." Ryan has also criticized the President's proposed budget. "If there's anything that economists on the left and the right agree on, that supply-siders, classic economists and Keynesians agree on, you don't raise taxes in a recession," said Rep. Ryan. "This budget is raising taxes in a recession." Ryan was joined in his opposition by among others the American Petroleum Institute, the oil industry's most powerful trade group. Ryan is either badly misinformed or deliberating misleading the public. The economic stimulus package signed into law by Obama last week enacted one of the largest tax cuts ever, which made good on Obama's campaign promise to cut taxes for 95 percent of Americans. The first benefits from these cuts should be seen no later than April 1, 2009. Obama has proposed increasing marginal tax rates on the richest 5%, people earning over $250,000 annually, and on hedge fund executives who have used tax loopholes to pay lower rates than middle income Americans. As Office of Management and Budget Director Peter Orszag said, "Folks need to actually look at the budget document." To avoid raising taxes during the recession, these increases will not take effect until 2011. The ranks of the unemployed are growing. People in Wisconsin are losing their jobs, their healthcare and their homes. It's time for Congressman Ryan to worry less about imaginary problems and phantom tax increases and devote his attention to the real problems facing Wisconsin's increasingly beleaguered working families. Obama keeps promises to labor, but Corporate America fight back! The New York Times' labor reporter, Steven Greenhouse, writes that labor has been very pleased with President Obama's efforts to reverse the Bush administration's anti-labor policies and with his labor appointments. But Greenhouse warns that business organizations such as the the U.S. Chamber of Commerce are gearing up to defeat the Employee Free Choice Act (EFCA), legislation that would make it easier for workers to organize unions. We can expect the Chamber to use fear mongering and the courts to oppose EFCA in the same way that the Milwaukee Metropolitan Chamber of Commerce (MMAC) has used them to try to stop the implementation of Milwaukee's paid sick day ordinance. The current recession is the consequence of a thirty year failed experiment with laissez faire economics. But the U.S. Chamber and its local affiliates like the MMAC remain wedded to the market extremist pillars of deregulation, privatization and anti-unionism. Greenhouse's article is linked here.